Join us for Sunday Worship at 9.30am followed by coffee fellowship in the guild room. Farnell Parish Church was built in 1806 by James Playfair alongside the remains of the Old Parish Church (see separate site.) It is a striking building with several Gothic Revival architectural details. The church was built with red sandstone ashlar blocks, now heavily weathered in places. The roof is slated. The church stands within a large graveyard in the small rural community of Farnell. A number of Pictish stones and long cist burials have been discovered in the graveyard, attesting to the site's historic past. The interior of Farnell Church is light and welcoming. The walls are plastered and painted white and the floor is of stone slabs. Two windows in the north wall have been blocked and plastered over on the inside, leaving a plain wall. The interior was refurbished in 1929 when the extension to the west was built, the most dominant feature of the interior is the fine plaster vaulted ceiling, with carved springers and corbels. The two parishes are located in the north east corner of lowland Angus midway between the coast and the glens and are barely five miles apart. Nevertheless they are very different, Gardner Memorial being a town church with concentrated membership of about 480 whilst Farnell is a country church with approximately 100 members spread over a much wider area. 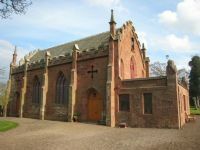 Both churches are members of The Esk Parish Grouping which includes all the churches in both the City of Brechin and the surrounding area. The bell is rung every Sunday for call to worship.